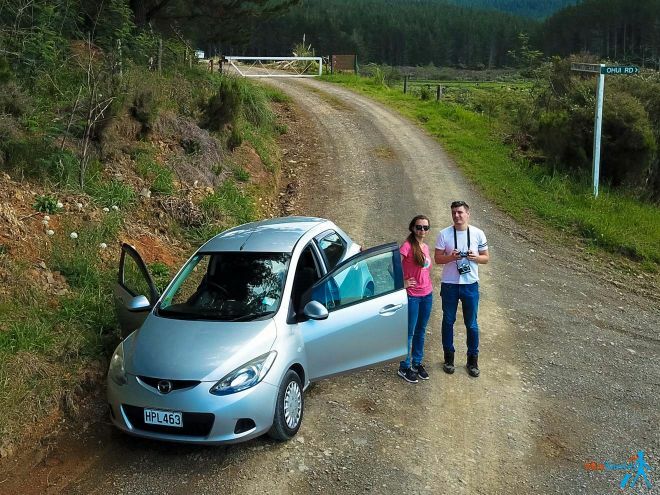 Deciding to rent a car in New Zealand can be one of the biggest favors you will do to yourself because it will make your journey truly unforgettable. 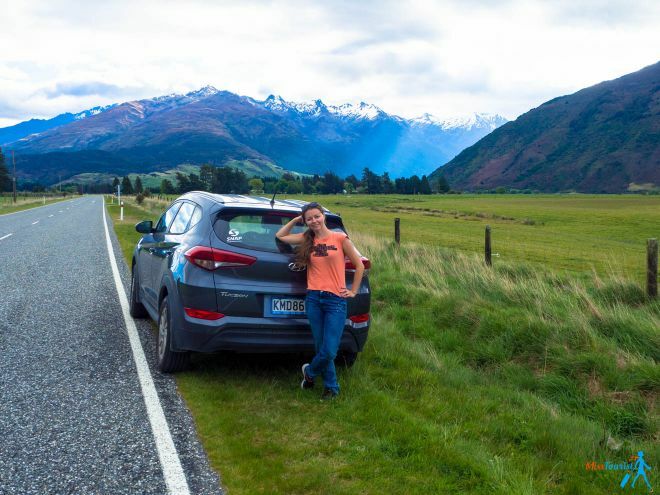 There are other ways of getting around in the country and I have described them here, but the best decision by far would be to discover New Zealand by car on a road trip. Why? Because you will get a lot of freedom and flexibility! You will be able to get anywhere you want, won’t need to worry about the car’s maintenance and you will have plenty of choices for all budgets. Renting a car comes with one important advantage – you can pick a hotel outside the city that would suit your budget. The hotels are usually just charming and you won’t need to worry about the transportation. You can skip this information for now and go jump directly to the deal. The car hire I used is offering a 10% discount to all my readers! 5. 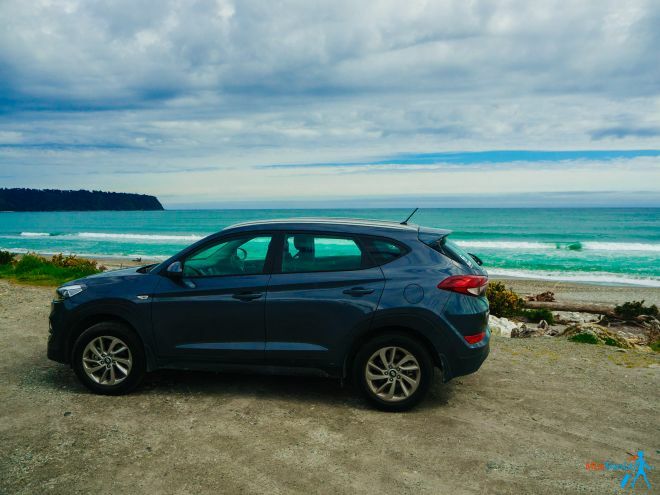 How much does it cost to rent a car in New Zealand? 6. 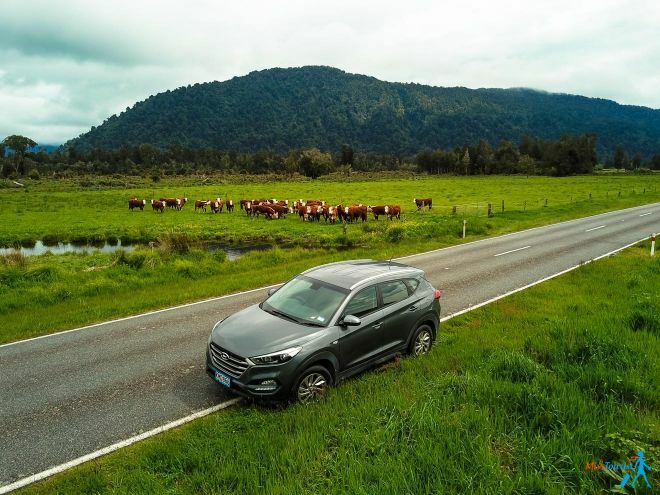 Road quality in New Zealand, do I need an extra insurance? 7. Which type of car to choose? 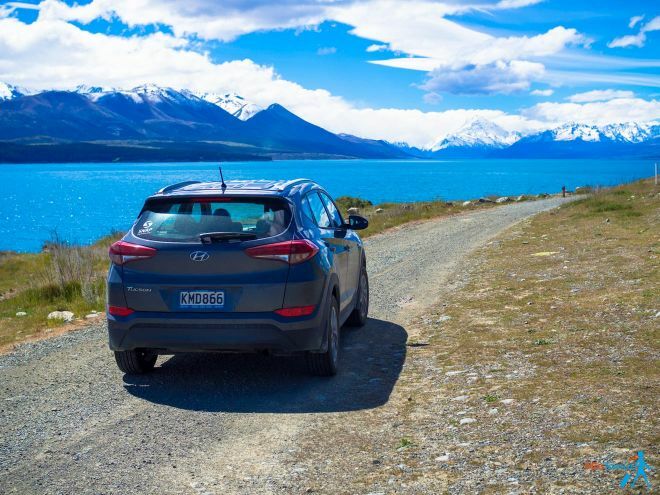 Best car hire in New Zealand – how to choose? You might be aware of it already, but this is an important issue to keep in mind. If you are from the UK or some other left-sided country, you will feel at home, but for most of us it will be a bit tricky to get used to it for the first day or two. 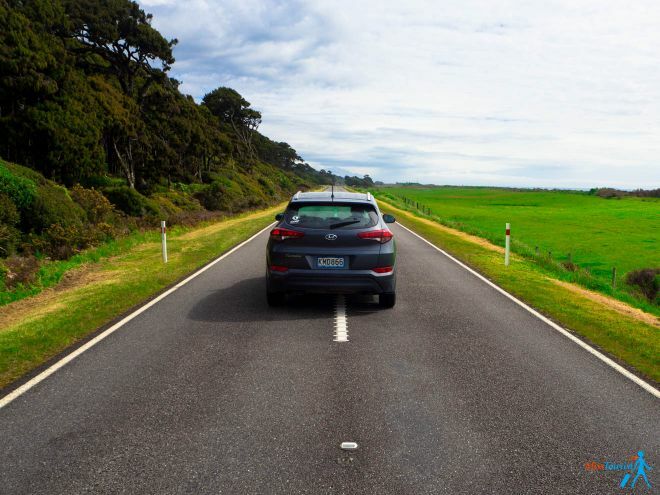 You don’t need to worry, just keep the white lane to your right at all times and learn how to deal with roundabouts there (driving direction – clockwise) and I promise that in a couple of days you will be completely comfortable with driving in New Zealand! 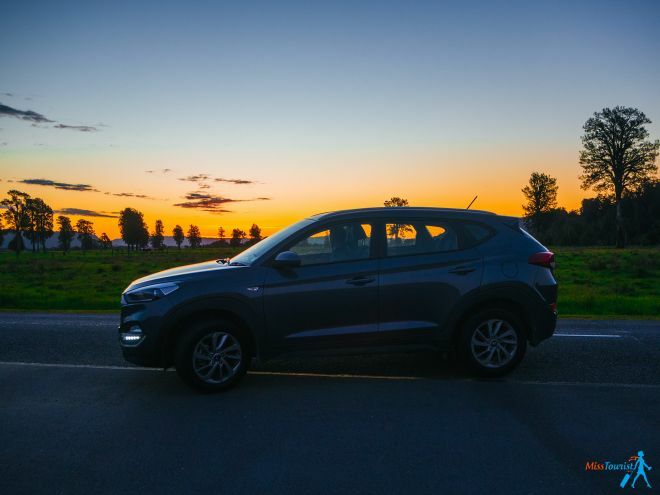 Most people pick this up very fast, but if you need some time to get used to it, I recommend getting a good night’s sleep before your first drive in New Zealand. If your driving license is not in English, you must take care of having an accurate translation in advance. The translation cannot be done by yourself, it can only be authorized either by your country’s embassy or consulate, either by a New Zealand Transport Agency service. This rule came as a surprise for us (my boyfriend was driving and his driving license is in Romanian). So, our rental company had to contact the Transport Agency as soon as they were open. It cost us 40 NZD extra and about an hour waiting for it to get sorted out. So, if you can take care of it in advance in your country for free, why not do it? Note: this obviously only applies to people whose driving license is issued in a non-English speaking country. The price for car rentals in New Zealand can actually be quite cheap if you book in advance. And it is no secret that, as the supply of cars lowers with time, the prices will skyrocket. Book your car as much in advance as possible, especially if you are planning to travel in high season (December to February). During these months the rates will only go up with time and never down. PRO TIP 1: to further reduce your cost, you can buy most of the things in advance, because they will probably cost a small fortune in New Zealand (keep in mind that this is a distant country that needs to import a lot of things and the transportation is expensive). You can find the full packing list with recommendations of clothes according to season here. PRO TIP 2: most rental companies offer free airport pick-up. Double-check that information in advance. I recommend getting your car right at the airport (check out the picture below to see how organized the process is – and you can call any car rental company located around the airport free of charge). It is much cheaper to get your car at the airport than going to the city and then picking up your car there (18NZD per person by bus, around 65NZD by taxi). Yes, this is actually a thing on New Zealand roads – so, do not be afraid of all the dead possums you will encounter while driving! 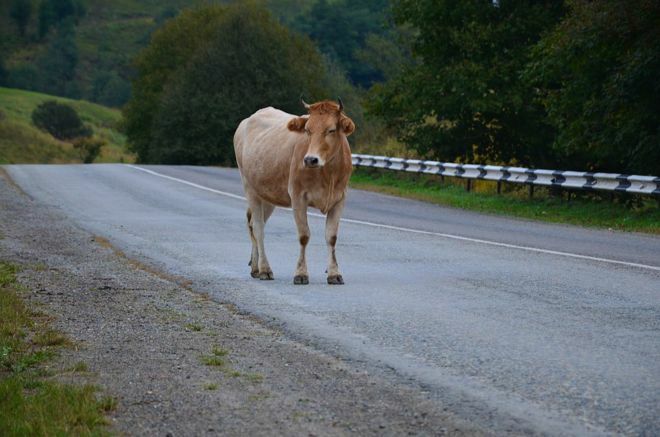 We have seen so many of them on the road that I could not help but ask the locals why this happens so often. Apparently, Kiwis are actually trying to kill them. Why do they hate possums so bad? The reason is that even if it’s a small animal, it is actually pretty much the only predator in the country. Hence, all the other species, such as kiwis and many others are endangered because of them. The possum population has been growing uncontrollably for many years now simply because there is no one above them in the food chain. 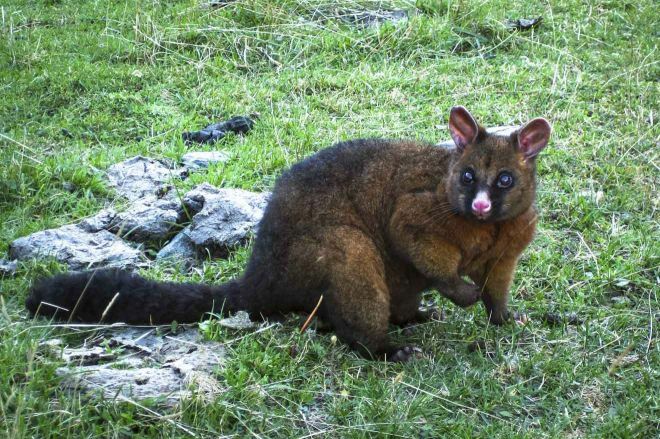 That is why they are a very serious threat to the natural habitat of New Zealand and Kiwis are taught in schools that it is good to kill possums. NOTE: Do not forget that except possums, there are also sheep, cows, birds and rabbits that can unexpectedly jump on the road, so watch out for them at all times. The prices vary depending a lot on 1) the season 2) the type of car you will choose. Here I will give you a very approximate estimate of what to expect, but please keep in mind that it can vary significantly. All prices are in NZD, for 1 driver over 21 years old, renting from Auckland, and with basic insurance. Campervans prices are for 4 people in the van. 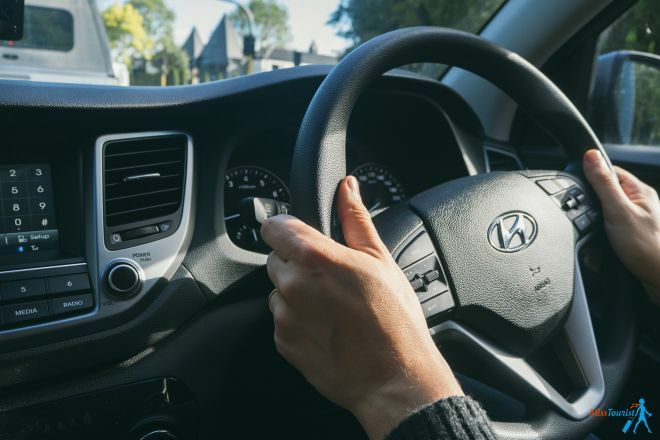 I would not trust those companies that are offering car hires for 9NZD a day, there is a catch somewhere and you will figure it out when using it – old car models, strict hiring dates etc. As New Zealand is so far away, imagine the transportation costs for getting gasoline there. As a result, gasoline is quite pricey; when I was there, the price was around 2NZD per liter, which means a full tank of gas will be around 70-100 NZD depending on the car. Book as early in advance as possible – I cannot stress enough how important this is! Check the location – if it’s much cheaper to pick up the car in the city, it might make sense to make an effort and get it from the city opposed to renting a car right from the airport. Rent for a long time – sometimes car rentals give a big discount for booking longer than X amount of days. Keep an eye on it and you might find something interesting! Second driver fee – check if your company charges an extra fee for an additional driver. Not all of them practice this, but some do. 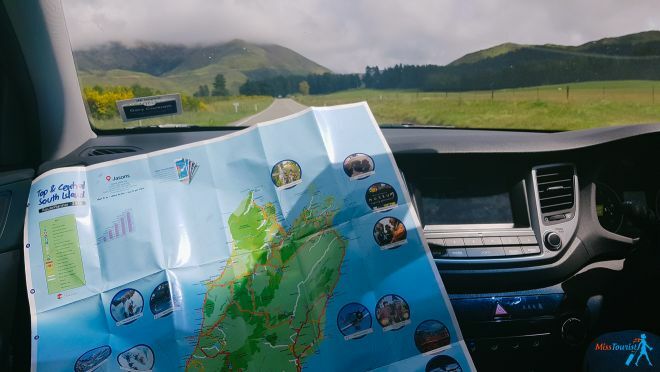 If you like using an actual GPS and not your phone (for us, the phone was enough), I would suggest buying a GPS device before the trip, uploading all the New Zealand maps you need on it and using it during your road trip. GPS usually comes with an extra charge of about 10NZD per day, so you can easily avoid that. Inspect your car carefully before taking it – write down any damage you notice. You do not want to pay for it after the trip, do you? 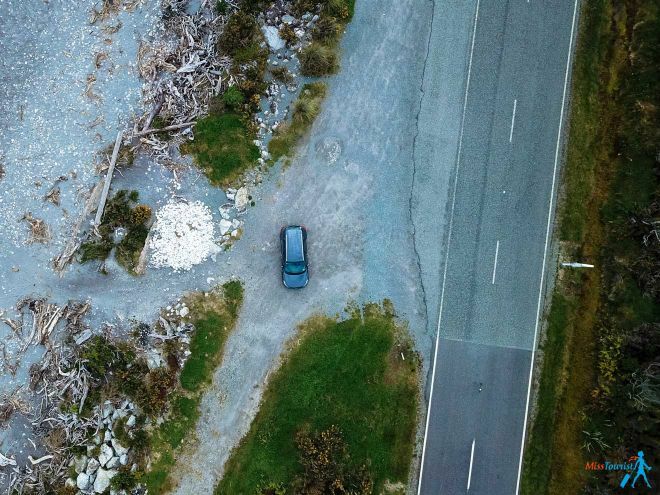 Check the car relocation option – many people leave their car in Christchurch and the cars need to be transferred back to the home office to Auckland. That is when car rentals throw some really nice deals, and sometimes they can give you a car for free and even pay for your ferry ticket. I do not recommend this option if you want to properly see the country though. You will only have a couple of days to deliver the car, so it would only work if you want to get from Christchurch to Auckland fast (but I would take a plane in this case). Check the rates for cars here! 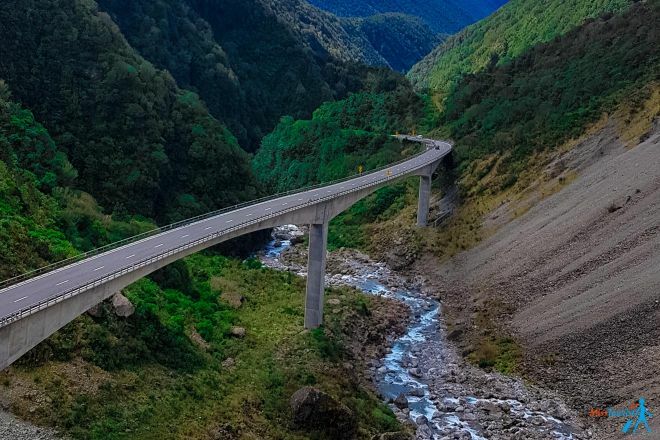 The roads in New Zealand are great, it is a real pleasure to drive there, especially given the idyllic surrounding! 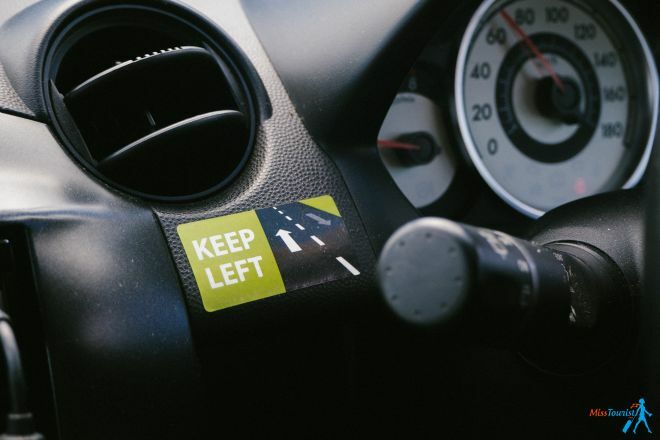 Please check Drivesafe.org.nz to learn more about their road rules and conditions. Keep in mind that roads in the South Island are narrower, hence leaving you less space for maneuvers. 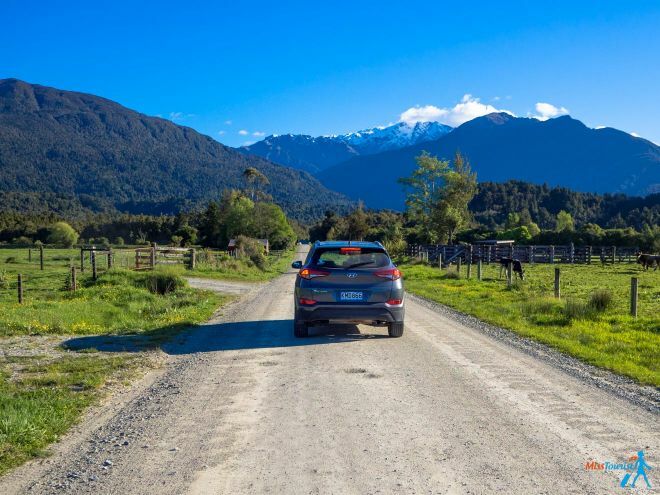 You might also experience some difficulties driving on a terrain – there are many hilly and narrow roads in New Zealand and there are even some gravel roads too (usually leading to something really spectacular), so I suggest taking an anti-gravel insurance. If there is a car in front of you, try to keep a longer distance between you and them, as a little rock from his car can easily land on your windshield. Remember, it only takes one little rock thrown in the windshield to open a crack that you will have to pay for. Also, try not to leave any valuables in the car. No country is completely safe, not even New Zealand. At some point, I have seen a car with a broken window and everything was stolen from there. Because we had to leave a lot of valuables inside (I am a travel blogger, so I have a lot of equipment, my boyfriend is a programmer, so his laptop has everything on it), we decided to opt in for an anti-theft insurance just in case, you never know. 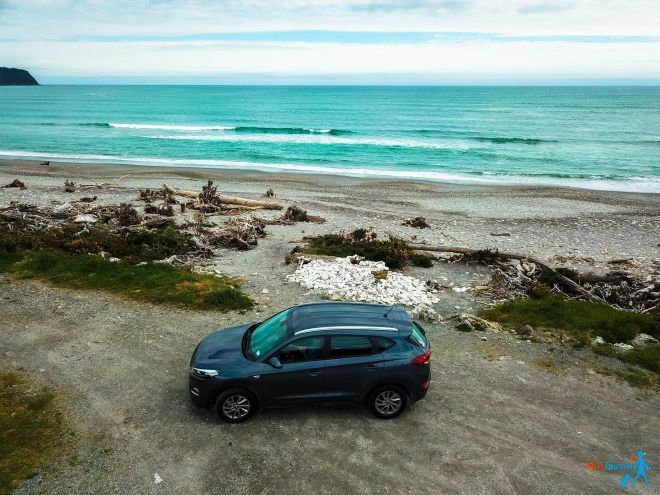 The standard insurance usually requires that in case an accident happens, you pay an access of 2000-3000 NZD and then the insurance covers the rest. I recommend looking into options that would cover you fully, either through the bank that you use in your home country, either by getting a better insurance. RELATED READ: Trying to create an itinerary for New Zealand? 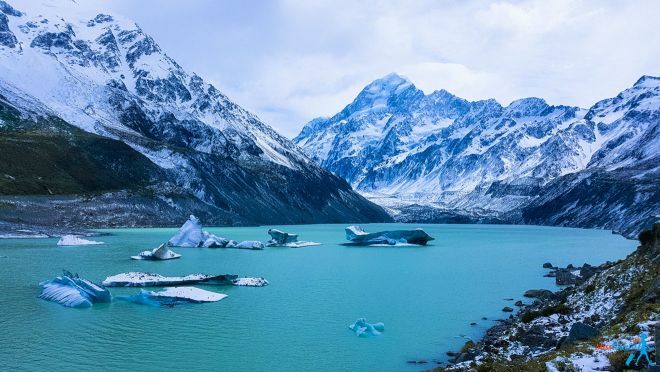 Here are the Top 10 best things to do in New Zealand! By the way, did you know that 3rd party insurance isn’t mandatory in New Zealand? These are bad news, my friend. You know why? That means that if you get into an accident with a car that doesn’t have any insurance (there are many cars like that), you will be responsible for the damage even if it’s not your fault. That is why I strongly suggest getting the premium, 0 excess insurance. That is 18-22 NZD per day, but it will help you have a stress-free vacation, so I’d say it is worth it. PRO TIP: Keep in mind that many credit card holders have their bank covering some car rental insurances, especially in the US. Double-check that info with your bank before taking the insurance. Could you use a small economic car or do you need a big minivan for the whole family? What distance do you want to cover? a couple – a rented car would suit you great, especially if you are a nature addict! This is the most popular option for discovering New Zealand because you can tailor-make your trip and stop anywhere you like for pictures. You can choose either a normal rented car (my choice) or a camper van and stay in camping zones. a group of friends – depending on how big your group is, a camper van or a car will be great for you as well. You will be able to share the transportation costs and it’s also a lot of fun sharing the beauty of a country with friends, isn’t it? 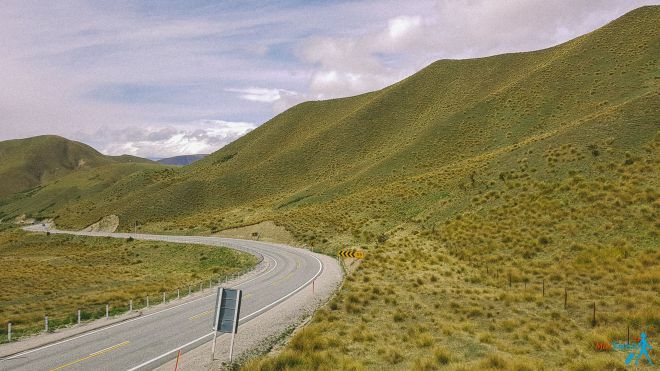 budget traveler/solo traveler – if you’d like to meet new people, I think that one of those prearranged hop-on/hop-off buses that go over the whole country can be a great option for you! There is no driving involved, so you can relax and enjoy the views! A family – a camper van is a great option for a big family (bonus points – you can cook there!). If you are a family of 3-4 people with not much luggage, a normal car would suffice. budget travelers not fond of party buses – In case the rental is too expensive for you, you can also do this – buy a car/campervan and sell it afterward. I am dead serious, people say you can do it, but you will need to stay for at least 4-5 days in a city to make sure you will sell it. travelers that don’t drive and are not fond of party buses – you should know that there are also trains in New Zealand. They don’t go everywhere of course, but they have a quite big coverage. Check Overlander and Transcoastal to see the routes. Another option is to go by public transport, but again, you will be limited by a certain route and you can’t stop on the way. 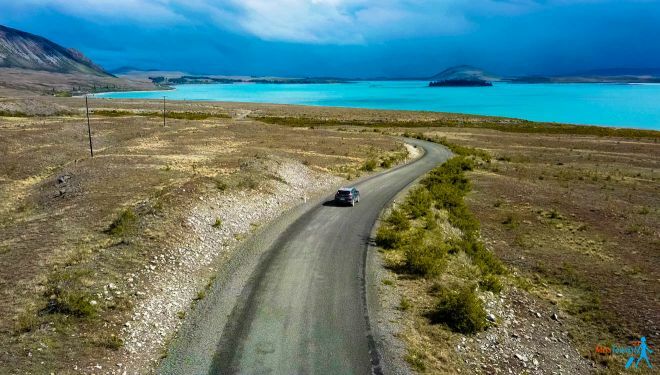 traveling on very, veeerrrry limited budget – having little money should not stop you from discovering New Zealand – you can either hitchhike (it is not illegal in the country) or cycle around the country. I know these options are for adventurous travelers, but it can definitely be done! VERY IMPORTANT! Do not choose European cars (like Peugeot etc. ), because if something breaks it will cost you a fortune to replace it. Choose a Japanese car instead, as Japan is close to New Zealand, so the transportation costs are not enormous. These are the words of the owner of the car rental I used, so I would trust him. Rented car or a camper van? So, the question is – what is the better option – a car or a camper van? First of all, you should think about where you are planning to go when choosing the right type of vehicle. If you want to explore beyond the main highways, consider getting an SUV, otherwise you should be fine with a standard car. Renting a car is the best option for you in case you like comfort, you don’t want to cook your own food and you want to sleep in a bed at night. I am one of them, so I opted for a car and stayed in hotels overnight. 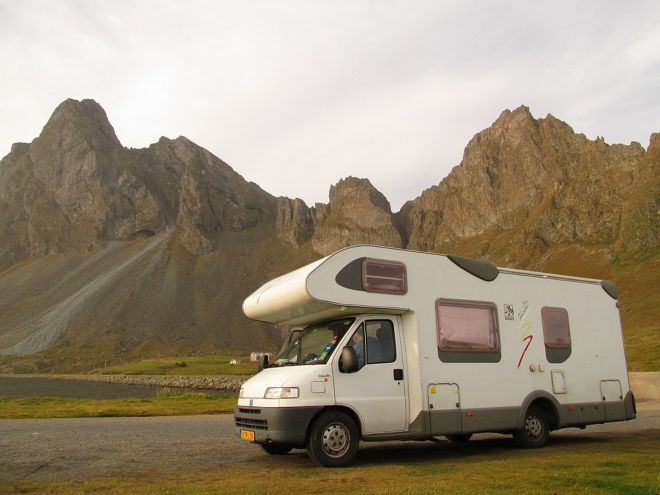 Motor homes will be ideal for you if you are traveling in a group of people and you don’t mind (or even prefer) staying in a camping place overnight. 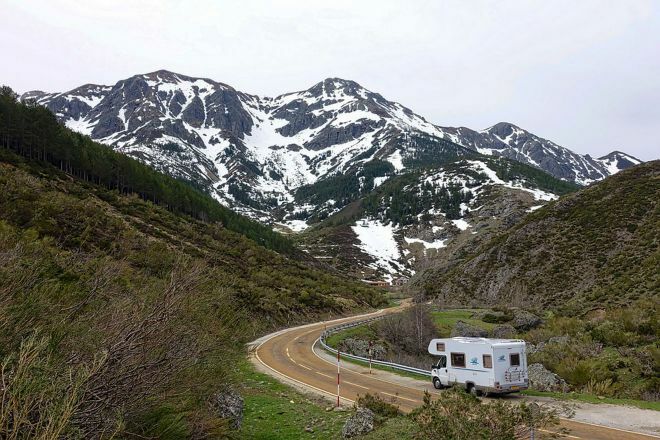 There are some amazing camping spots out there that will let you use their facilities such as shower, kitchen and charging station for your van. Keep in mind that this is not always cheaper than a hotel room though. Freedom camping for self-contained vans (read – with toilet) is legal in some places in New Zealand, but not in the most popular places. You will usually have to pay a minimal fee there. Remember, if you are not going to camp, you do not need a camper van so you will also save a lot on gas this way. If you don’t want to camp and you would prefer staying in a hotel instead, I recommend reading my article about New Zealand’s Best Hotels – A Plan To Help You Book All Accommodation In Minutes. Now that you know what type of car you want to rent, let’s talk about how to choose an ideal company and which are the most important things you should consider? If you Google something like “Best car rental in Auckland”, you will be quite spoiled with options, both international and local. The choices are endless and the question is – which one to choose? 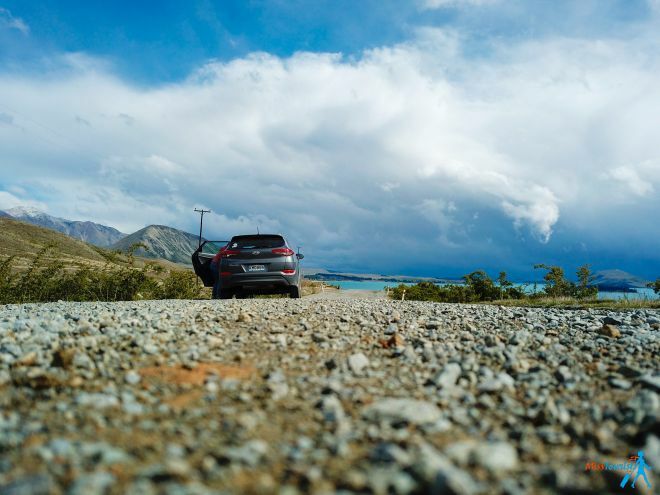 Spoiler alert – I used Snap Rental, I liked both the car and the service and I can vouch for them (more on my experience with Snap rentals below here. They also give 10% discount to all my readers, yay!). Other budget options include Thrifty, Budget, and Europcar. 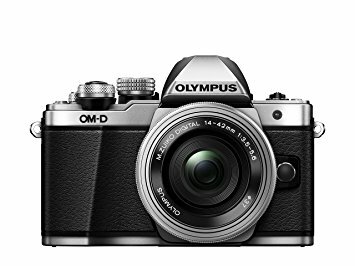 I suggest you can use this great price comparison website to see the best deals for your dates. 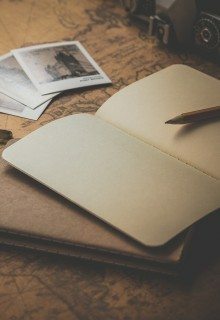 Read the company’s reviews – what do other people say about them? Read the Terms and Conditions – are there any hidden charges that you did not know about? Very important – Check if you have a mileage limit! Do they provide a free airport pick up? Do they provide 24-hour roadside assistance? Is there any late return car penalty? When do you need to bring the car back? The company started as a backpacker car rental company 5 years ago, when they bought a number of cheap cars from Japan. However, they completely changed their model very soon and only offer new cars now. The average age of a Snap Rental car is 18 months. Our car had only 16 000 km and it was brand new from 2017. It was a pleasure to drive it! Snap Rental is the 11th fastest growing company in New Zealand and they are doing so good because they provide the greatest quality and their customers appreciate that. You can even rent Tesla Cars from them, Snap Rental is the first and only company to offer them in New Zealand! As the owner explained to me, they buy cars at a very good price from the official dealer, and then give them back when the cars are a couple of years old. Thus, you can be sure you will get a new car! 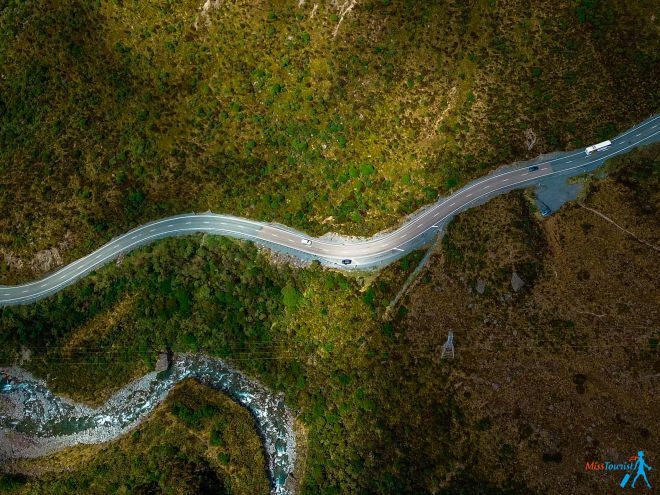 And trust me, in New Zealand you do want a new car, an old car with a steering wheel that can stop working at a mountain curve is not good for you. Taking safety, comfort and fuel economy into consideration, I would totally go for a new car! Snap Rental has a 24-hour support, which we never used, but it was great to know that we can have some help at any time. And the BEST NEWS? I have negotiated a 10% discount for all my readers! Enjoy the 10% discount to all cars! The discount is only for the car itself, not to the insurance – as the guys from Snap Rentals explained to me, it is a different company and they can’t give you discounts on that. This is still significant saving though! NOTE: You need to book before 31st of May 2019 in order to get the discount (your travel dates can be later, but you need to book the car before 31st of May). They have a bet price guarantee! What’s even better, they say they will beat it by 10%, yay! If you do not like the prices/available models on Snap Rentals, I always suggest checking Rental Cars, they will compare the prices of ALL car hires in the area – both international chains and local companies and it is very easy to filter results there. 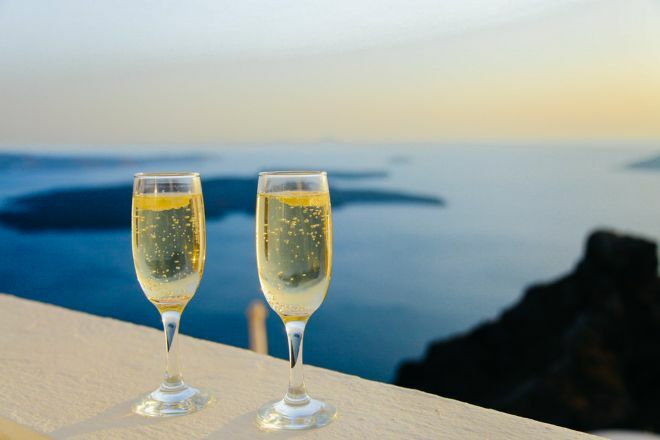 Click here to see the available deals for your dates! It is illegal to talk at the phone while holding it, so you can either use a Bluetooth connection if your car is equipped with it (ours was and it was very comfy) or use headphones. It is dangerous and you might be fined by the authorities, so it’s better to avoid this from the beginning. Think ahead about fueling up! There are some parts on the road where you can go for a couple of hours without a single gas station around. Always check how far away is the nearest one and if it’s convenient to fill your tank now or later. If you are camping, download CamperMate App – it is super useful to see all the camping places available and what facilities they have – with prices too! 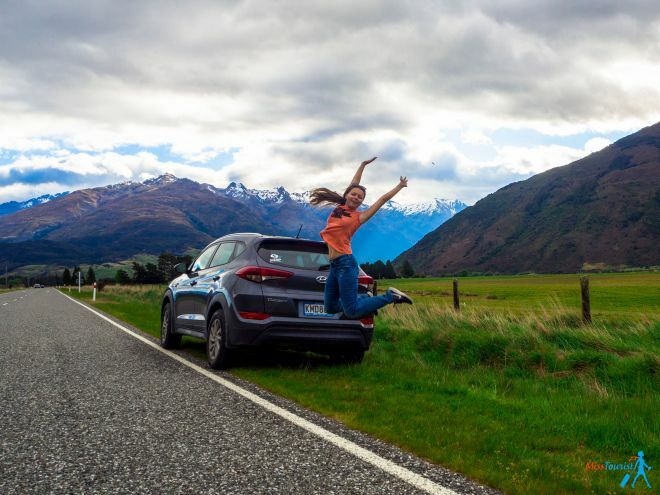 The driving age begins at 18 in New Zealand, but individual companies can impose their own rules and I have seen age restrictions from anywhere between 18 to 25. Read the T&C carefully before booking. 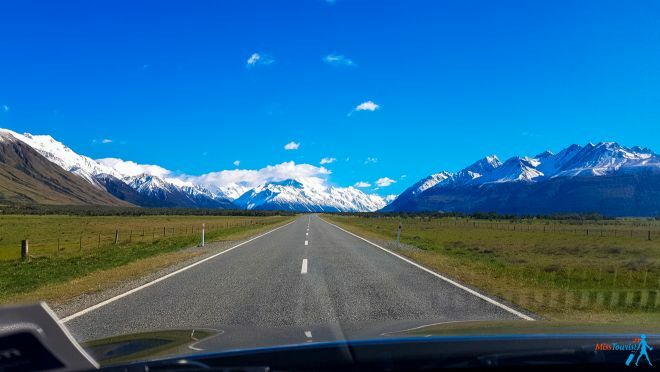 As I said, the weather in New Zealand is not as harsh as in Iceland, but some roads do get closed due to snow and they also have black ice – a quite common thing during winter. Look out for wet patches and avoid sudden breaks! In case the road is snowy and your tires are not equipped, you can also rent snow chains. They are about 5-6 NZD per day. As I said earlier, in most cases, you will be fine with a winter-equipped standard car so there is no need to get an SUV car. When to go to New Zealand? Summertime is probably the best (that is December to February in New Zealand), but I went in October (that was middle spring for them and it was totally fine). 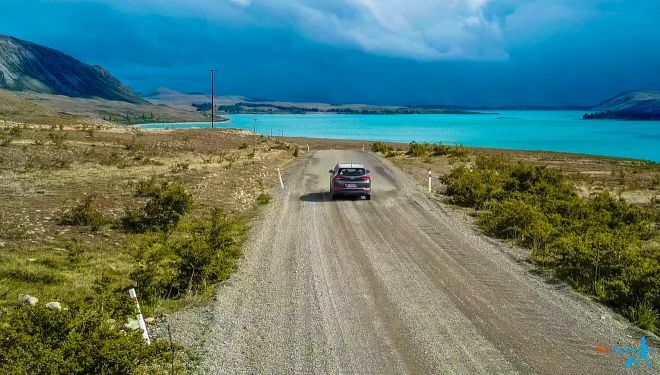 The weather conditions in New Zealand are not as rough as in Iceland, so the roads are still drivable in the wintertime; you just need to pay a bit more attention, that’s it. 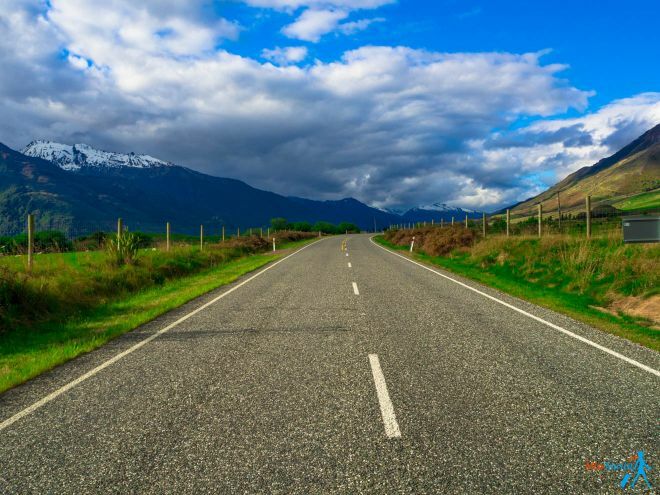 What is the speed limit for driving in New Zealand? The open road speed limit is 100 km/h (62 mph). It also might be 80 km/h in some cases, but there will be a sign. The default urban limit is 50 km/h (31 mph). Here is an updated list of speed limits for all kinds of vehicles. Also, remember to not overtake on yellow lines! What are the alcohol limits for driving in New Zealand? If you are 20 years old or younger, you are not allowed to have ANY alcohol in your blood. If you are over 20, the limit is 250 mcg/L, but this might be lowered, check the updated rules here. The blood alcohol limit lowered from 80mg of alcohol per 100ml of blood (0.08) to 50mg (0.05). Traveling with kids in New Zealand – do I need a special seat? If your child is younger than 7, he/she must be secured in an approved child seat appropriate for their age and size. In most cases, this can be provided by your car rental company, but you should double check in advance to see if this is included. Buying a seat there might not only be very costly but also time-consuming to find. 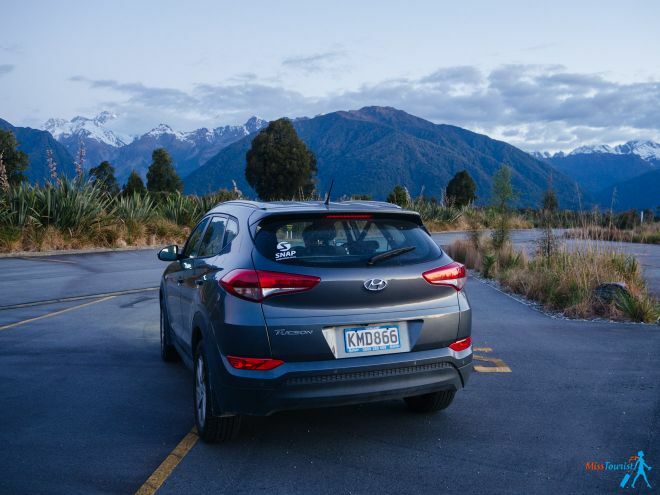 Renting a car in New Zealand is probably the best option to discover the country and the most common one, too. Whether it is a car or a campervan you decide to get, there are plenty of options across a wide range of budgets, but be sure to book your vehicle as much in advance as you can! 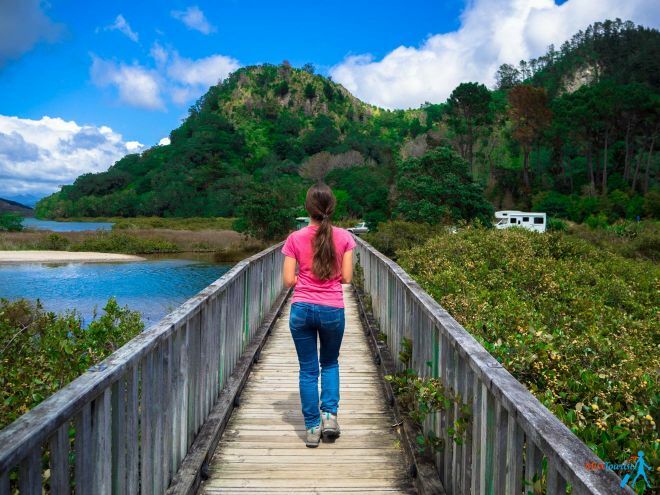 New Zealand is all about the journey, so if you will find spots where you want to stay longer, be sure to do so and enjoy the beauty of the moment, do not rush it! 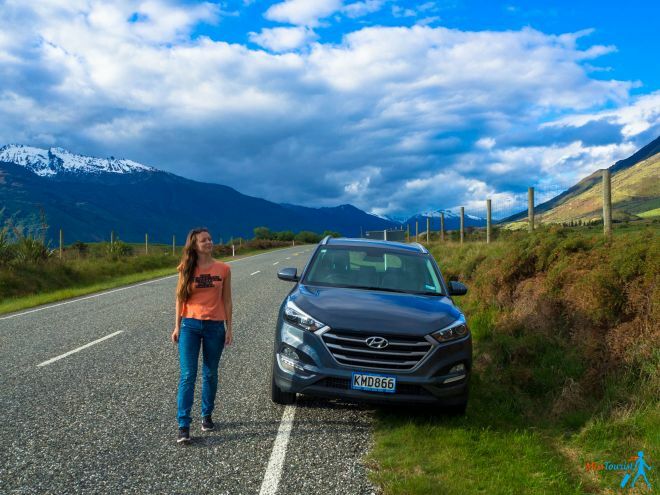 In the text above I have mentioned the most important things you should consider when renting a car in New Zealand plus some recommendations on which car type to choose according to the type of traveler you are also some price approximations. If you need more help planning your vacation, please check all my New Zealand posts, there is plenty of info there! I hope you will have a wonderful trip in New Zealand and do not hesitate to let me know if you have more questions! Thanks, this is so useful! ıs ıt ıllegal to stay ın a car somewhere ın the queenstown cıty overnıghtly? It is not illegal to sleep in your car in New Zealand but local authorities might have by-laws banning it in their area. The problem is with freedom campers, camping in the streets’ public car parks and empty land, causing litter (including food scraps) and unsanitary conditions due to calls of nature. Great information thank you for your help. Welcome, have a wonderful trip! I will be 70 years old when we rent a car. Is there an age limit on rentals? good question! The policy will depend on the car company you will choose, some of the might require an extra payment (it’d clearly say that in your final price). I reached out to Snap Rentals, they said they do not charge any extra, you just need to have valid driving licence. Great post Yulia. Small correction: the driving age in New Zealand is 16 years (not 18). I’m a New Zealander who got my licence many years ago at age 15, but the age was raised in 2011 to 16. Hey Jim, thanks so much for the comment! 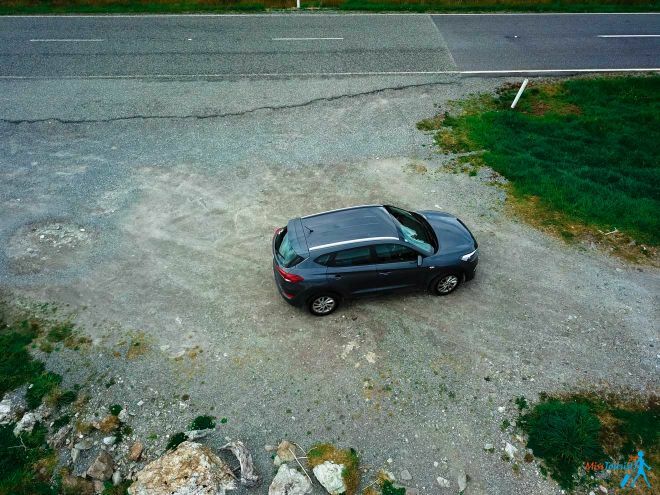 Did you need to have an international drivers license to drive the rental car in NZ? Or just a drivers license in English? I looked at the NZ.gov page and it did not appear so but figured I would ask. Thank you! Yes, just English it enough, it doesn have to be international. I would like to find out if your promo code is still available? I tried it just now but I do not see the 10% discount being offered. Would like to find out if your promo code is still working? Tried earlier this morning but didn’t see the discount applied unfortunately. Hey hi…nice and helpful post…just wondering….what are the fine charges for any damages or faults that happen with the rented vehicle? Maybe an approximate fare charge for these?